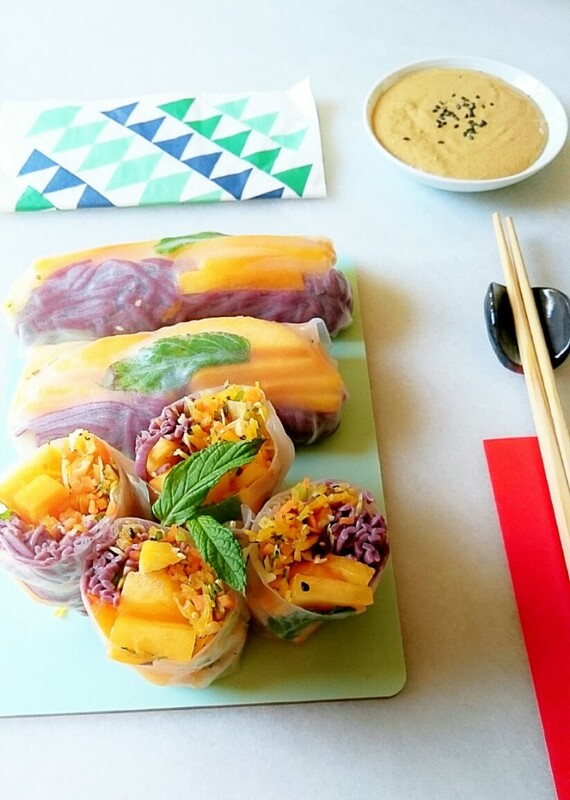 raw pumpkin & peach thai roll with tahini, orange and miso dressing. Raw pumpkin. Something pretty normal for many of us, especially now that all the “raw food” is so fashionable. The problem, as I see it, is that not all types of raw food suit everyone, although I must say that the summer is the perfect season to eat raw. For me, raw pumpkin was something that my mind had trouble understanding. Because when someone thinks that a particular vegetable is associated to an specific type of cooking, it is usually very difficult to put it in a different context. For me the pumpkin is a synonym of soup, or comes always associated to an oven or a hot dish. But when you think about it coldly, you realize that it is a simple mental blockade. Because if the carrot can be eaten raw, why not the pumpkin? Yes, just like that. Well, you just have to try it and you will realize that it is utterly delicious. 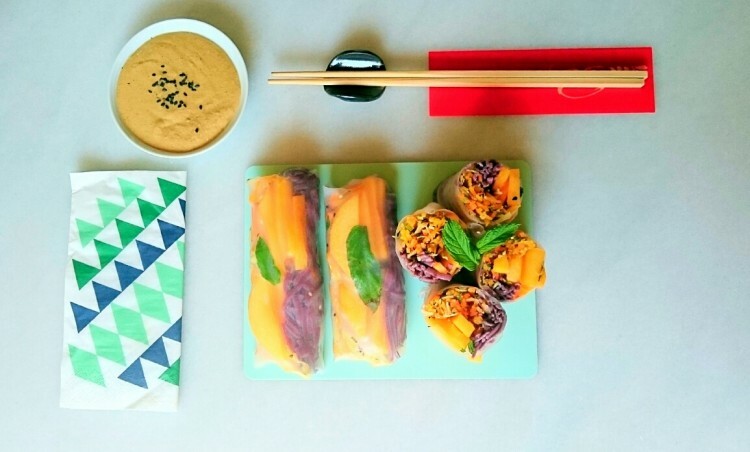 In today´s recipe I have used ingredients of the same sort: carrot and peach. And it tends to be sweet, that is why it is so important to make contrast with something sour, fresh herbs and some spicy stuff Everything very refreshing and with Asian flavours which are truly my downfall! And as I always say, you can use this recipe in many different ways depending on the weather, what you like at a particular moment or whatever you prefer at a particular time of the day. 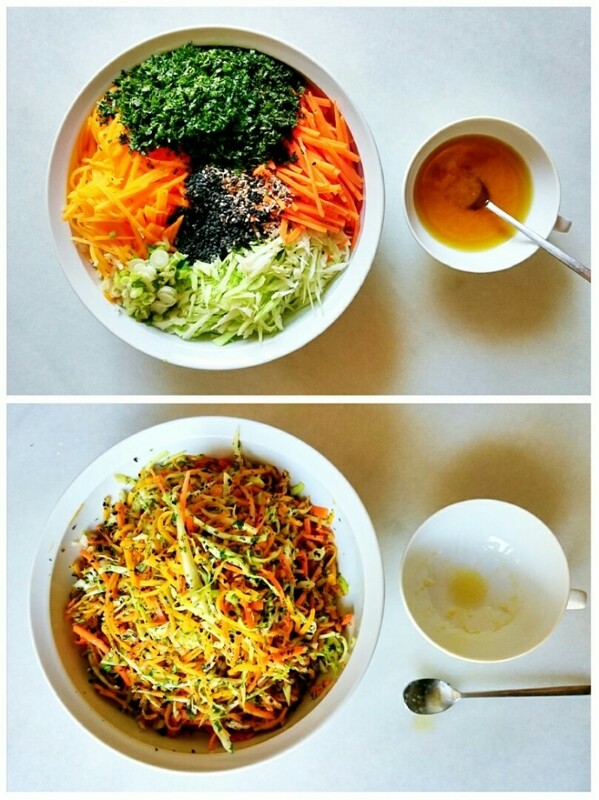 If you only want to eat a refreshing salad, then this is something absolutely perfect. 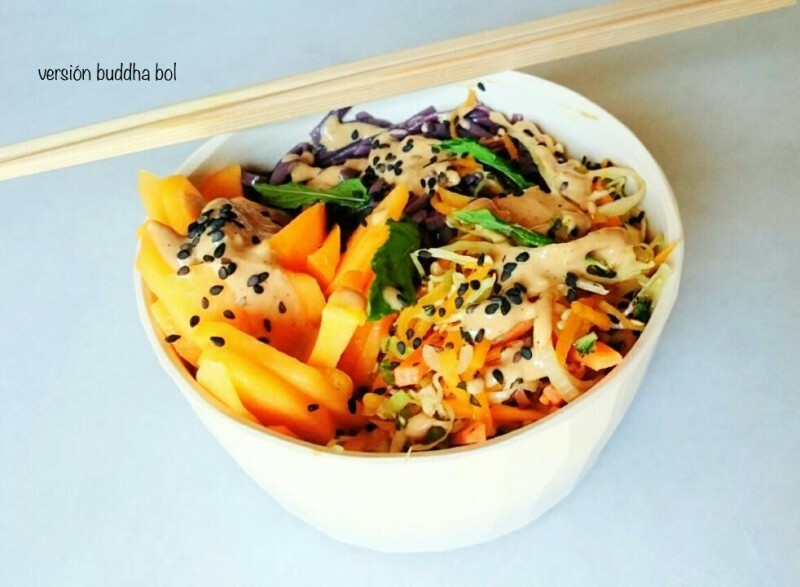 If you fancy a full plate but you feel lazy to make the rolls, or if you simply don´t have the rice leaves, then cook the noodles and make a sort of “Buddha bowl” with the peach and the sauce accompanying the whole thing . And you will love the sauce so much that you will eat it with spoon! It is perfect to accompany any other vegetable or rice dish, or cooked cereal. Try to cook double amount for this recipe and you will always have a dressing ready to give sparkle to any boring dish. 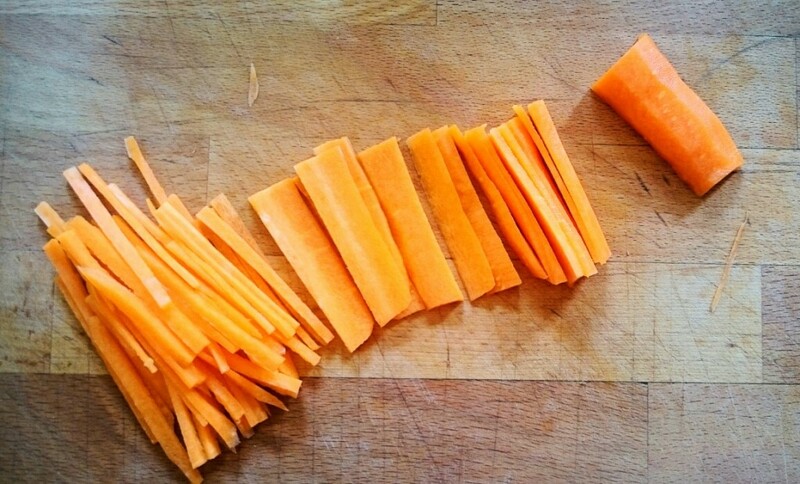 Cut the carrot and the pumpkin in thin sticks, if you have a mandolin slicer, it is time to use it. Chop the cabbage also very thin. Chop the herbs and the scallion and put everything together in a bowl with the sesame. In a small bowl mix the salt, the ginger, the lemon juice and the different oils. Pour it over the vegetables and mix everything well. Boil the noodles and cool them down well with cold water. Set them aside. Grind all the ingredients for the sauce and stand them aside. Cut the peach into sections and put them in a bowl. Take a deep plate or platter and put hot water in it. 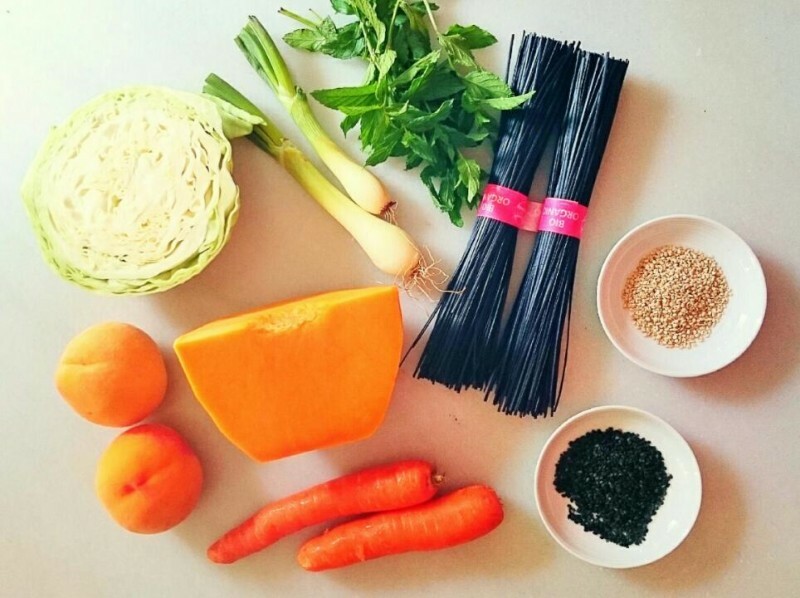 Prepare in the kitchen counter all the different preparations: salad, peach, noodles and rice leaves. 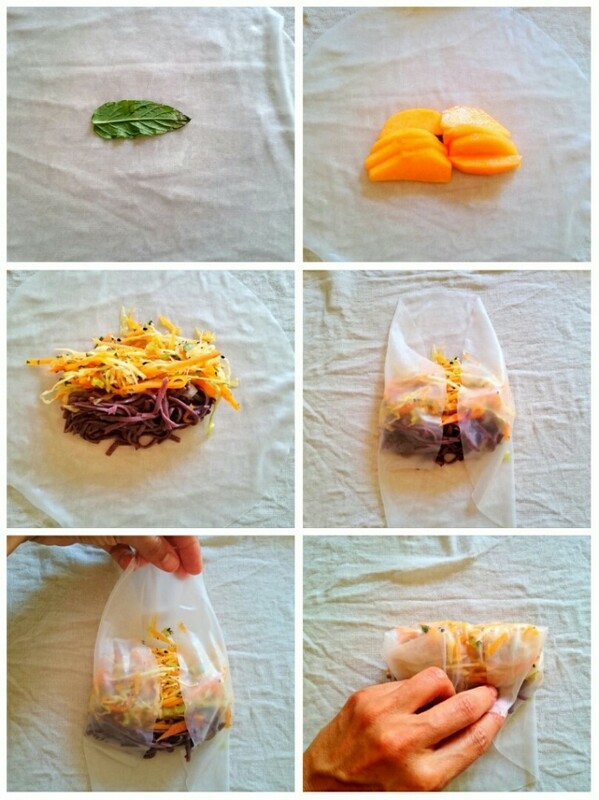 Put a moist cloth besides the bowl with warm water where the leaves will get moistened, and a plate where you will place all the rolls when they are done. Moisturize a leave during 20 seconds (it is important not to have them in water for too long or they will get broken), put it over the cloth and start to arrange the mint with the pretty side downwards, peach, the salad and the noodles. Bend it as you see in the photos and repeat the same operation with the rest of the leaves.